By guest blogger Liz Savage If back pain is supposed to be an affliction of age, why are back injuries and back pain becoming more common in children? Heavy backpacks are, of course, one culprit. Every autumn as kids head back to school, the American Academy of Pediatrics reminds parents of these backpack safety tips: Backpacks should weigh no more than 10-20 percent of the child’s body weight. Any heavy items should be placed closest to the center of the back. 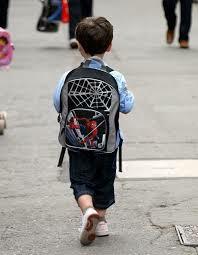 The AAP recommends a backpack with wide, padded shoulder straps—both of which should be used. (The one-shoulder carry can lead to poor posture and strained muscles as only one side of the body bears the weight of the pack.) They also advocate for a rolling backpack, but you should be prepared for rolling eyes when you suggest that plan to your kid. While concerns about hefty backpacks have been around awhile, pediatricians are now seeing more back pain in children who play sports. According to one estimate, low back pain occurs in 10-15 percent of all young athletes, though certain sports see even higher rates—college football players (27%), artistic gymnasts (50%), and rhythmic gymnasts (86%). Childhood sports are increasingly popular in the US, which overall is a healthy trend. Kids who play organized sports are more active, less likely to be overweight, and do better in school. A survey by the National Council of Youth Sports reported that 44 million children participate in some form of organized athletics. But as youth sports have become more competitive at younger ages—with year-round training and daily practice—some doctors have warned that training too hard, too young is dangerous and can lead to overuse injuries. “Overuse injuries occur gradually over time, when an athletic activity is repeated so often, parts of the body do not have enough time to heal between playing,” explains the American Academy of Orthopaedic Surgeons in its safety guide for young athletes. It’s easy for parents and coaches to miss these types of injuries because the pain is often moderate to start and isn’t associated with a fall or other evident injury. Half of all sports injuries in kids now are preventable overuse injuries, according to American Medical Society for Sports Medicine. In a study of 1,200 young athletes, Dr. Neeru Jayanthi, an associate professor of orthopedic surgery at Loyola Medicine in Illinois, found that lower back injuries were the third most common, after knees and ankles. About half of these back injuries kept the kids from playing for one to six months, and according to Jayanthi, put them at risk of long-term back problems. Repetitive bending and twisting are common causes. But the key to preventing these injuries, Jayanthi says, is variety: Kids shouldn’t specialize in one sport until late adolescence, and limiting the time in competition. “Young athletes can reduce the risk of back injuries by not spending more hours a week than their age playing sports,” Jayanthi told NPR. He also suggests that kids spend at least half as much time in unstructured play and gym class as they do on organized sports. Here’s part of the problem: during adolescence, when the body is growing rapidly, muscle and ligament development can’t keep up with bone growth. This can cause muscle imbalances and less flexibility, which in turn leaves the kiddos at greater risk of injury. The American Academy of Orthopaedic Surgeons also warns that young athletes can injure their growth plates. Growth plates are areas of rubbery cartilage at the ends of arm and leg bones where bone growth occurs in children. These points are weaker and more susceptible to fractures. “A twisted ankle that might result in a sprain in an adult, could result in a more serious growth plate fracture in a young athlete. Growth plate injuries have the potential to disrupt the normal growth of bone,” warns AAOS. So what can parents and coaches do to prevent back injuries and other overuse injuries in their young athletes? Help kids stay fit in the off-season. Kids should start general strength training and fitness exercises several weeks before their sports season begins. Gradually increase the frequency and intensity of these preseason workouts. Core-strengthening exercises and stretches for hamstrings and hip flexors can help reduce the risk of back injury. Try these back-pain prevention exercises for young athletes, recommended by the UCSF Benioff Children’s Hospital. Remember: back pain should not be considered an inevitable part of playing sports. If your child complains of pain, particularly if the pain is getting more frequent or intense, consult a physician. Addressing injuries early can prevent more serious damage. Make sure any sports equipment fits properly and is regularly resized as kids grow. If your child has been injured, encourage him or her to rest and heal. The extent of the injury will determine how long a kid should sit out, but studies of young athletes with lumbar spondylolysis—a stress fracture of the vertebrae and the most common cause of low back pain in child athletes—found that a three-to five-month break from sports was the most beneficial. Most importantly, limit how much time kids spend each week and each year on organized sports. Encourage unstructured outdoor play and a variety of sports and games.